The great American writer Henry David Thoreau once stated how he wanted to live his life in such Spartan-like conditions because he "wished to rout all that was not life." This mantra of living with brutal simplicity to avoid diluting the experience of life is one that has been lost on most Americans, and our convenience-filled cars are one of the best examples of that phenomenon. Unless you’re talking about the Honda Accord. There’s something raw and mechanical about that car that I love because it doesn’t try to exchange a good driving experience for comfort. 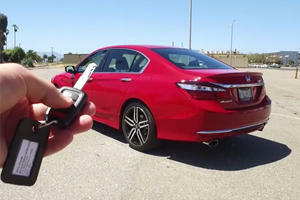 That’s why I was happy to learn that the Accord Sport with Sensing was scheduled to make a visit to the CarBuzz office. For enthusiasts on a budget and in need of practicality, reliability, and a driving experience that doesn’t feel like a Prozac binge, the Accord Sport has been the car of choice for years. It was a Car and Driver Ten Best winner 30 times in 32 years and its high regard has been backed up by sky-high sales numbers. Honda claims it has been the most popular car in America for 2013, 2014, and was still leading the pack last the automaker checked in November of 2015. With that kind of prestige, the Accord is begging to be knocked off, and unfortunately, in our view, that's exactly what happened. When it was dropped off at my front door, I was blown back a bit because visually it looked great. The days when Japanese automakers would make light, fun, and visually appealing cars are over for the most part, but you wouldn’t have guessed it on this Accord with its San Marino Red paint job, dual exhaust, 19" alloy rims, and chrome "Sport" badge on the trunk. If $26,785 (that includes the $820 destination and handling charge) gets buyers a reliable, family capable, and practical ride that looks this good, maybe it will hold off the mid-life crisis by a few years. Sitting between the base LX Accord and the pimped-up EX package, the Sport unlocks four more horsepower out of the 2.4-liter four-cylinder engine for a total of 189 hp and 182 lb-ft of torque. It's not exactly bursting at the seams with muscle, but what can you expect from a bargain sedan that’s supposed to be a Jack-of-all-trades? Inside, my tester came covered in enough black plastic and cloth to make it seem like Henry Ford chose the color palate. It’s not exactly the most visually enticing interior but at least there will be no regrets when the kids inevitably spill something back there. It’s also roomy, and the same goes for the trunk, which means that the Accord is a versatile family companion able to see the kids from the first ride home from the hospital to getting their licenses and having steamy makeout sessions in the back. Traditional of the Accord flavor is a frumpy but solid feel. The doors shut with an unrefined but solid thunk and the shifter slides between transmission settings with an industrial feel designed for longevity rather than silky transitions. This rough-around-the-edges-but-precise industrial feel oozes into every corner of the car and luckily finds its way into the driving experience. The electric steering may be numb to potholes and the 59/41 weight distribution forces the nose to slide out when the tires lose the battle with friction, but the Accord feels solid and communicative as ever, making the middle of a corner a fun place to be. It isn’t a top athlete, but it knows how to play the game well enough to make a driver let out a laugh of surprise. The Accord isn’t the cutie you take home for one night. This car is in it for the long term, provided you don’t opt for that damned CVT. As far as buzz kills go, the CVT responsible for doling out torque on my Accord Sport was the absolute worst and made us question why the word "Sport" was present anywhere on the car. Compared to the manual, the CVT knocks half a second off the 0-60 mph time, which at 7.5 seconds in sport mode is slow enough to make it a liability when it comes time to pass on the freeway. On paper the Accord doesn’t appear to be made for sporty driving, but with such a good overall feel we couldn’t help but guess that a manual would have made a night and day difference in terms of driving enjoyment. Even with the paddle shifters, which mimic gear changes but only help acceleration if you fall for the placebo effect, driving the CVT-infused Accord is like going to Disneyland and having to wait four hours for each ride. It's touted fuel economy return was respectable, with a combined rating of 30 mpg (26 city and 35 highway), but our crowded testing streets yielded 24 mpg courtesy of a lead foot. At least the simplicity of the infotainment system helped to make up for the experience. No navigation system was present on the car, but I appreciated the Bluetooth audio link and fairly ergonomic steering wheel controls, although even for a bargain priced sedan four speakers is a bit bare bones. The right side of the steering wheel houses some of the more fun buttons that make up the "Sensing" part of the Accord’s name. 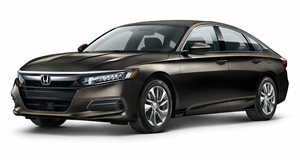 That package adds a millimeter wave radar sensor to the Accord that allows for collision mitigation braking, adaptive cruise control, lane keeping assist system, forward collision mitigation, lane departure warning, and road departure mitigation. Not wanting to place a car that isn’t mine in any dire situations, I was only privy to the adaptive cruise control system and lane keep assist, both of which were helpful for longer freeway drives. As one of the cheapest cars we’ve tested so far it was surprising to see the Accord Sport with Sensing loaded with some sophisticated driver's aids. Keep in mind that it was just recently that this tech was only available on cars like the Mercedes S-Class. Now it comes on budget Japanese sedans. Nice. In the next five to 10 years when all of these features become standard, an Accord Sport buyer will not be left in the dark ages even after spending entry-level money. Again, the only caveat to this is the transmission. It’s not that I missed the natural interruption of acceleration that a standard automatic provides, it’s that given how new CVTs are, automakers haven’t had much time to refine them. As a result, the Accord felt like a step backwards. Previous iterations have blended the entire package together so well. That's why the Accord is No. 1. It’s easy to imagine a buyer just a few years from now stepping out of the Accord and into a car with an automatic or a next-generation CVT and feeling a world of difference. We know Honda can make great cars, and the Accord Sport has all of the makings of one. In this case it’s the link between inputs from the driver’s right foot and what comes out of the wheels that’s diluted by the CVT. That alone gives buyers who can’t drive stick a reason to migrate to Toyota, Mazda, or any other automaker with comparably priced offerings. In all other respects, the Accord remains the top pick for those seeking the feel of a real car that the appliance-like Camry can't give. For that, and for keeping a manual on offer, we'll let Honda slide. When was the last time you cared much about what kind of car your Uber driver had? For those looking for a BMW 3 Series on a budget. 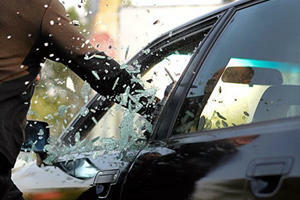 Is Your Set Of Wheels In America's Top 10 Most Stolen Cars List? 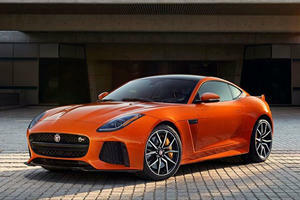 Even if it isn't, we sincerely hope your car isn't included in the NICB's Hot Wheels statistics.